Students at Peabody Montessori Elementary School traveled with children's author Paul Aertker to London and France without leaving the school auditorium thanks to his way with words. 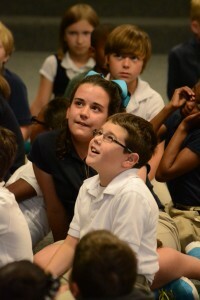 He shared passages of his book “Brainwashed” to students in fourth through sixth grades on Thursday. It is the first in a series called Crime Travelers by Aertker, who now lives in Denver, Colo. The mystery novel is about a boy who leads a group of international teenagers to Paris on a secret mission to stop a company from brainwashing children. Aertker, a 1983 graduate of Holy Savior Menard Central High School, also is a former teacher and avid traveler. He used those experiences to emphasize the importance of reading. He gave the students an example of the power of words by describing his experience as a teenager camping out in London to see the royal wedding between Prince Charles and Princess Diana. He included details from street decorations to guards to Diana's wave from her window as she passed, and every student was silent with eyes locked on Aertker. He asked if they could see what he saw, and they said yes. “You can take a couple of nouns and a couple of verbs and make pictures,” he said. Fellow Menard grad and Peabody Montessori Assistant Principal Kelly Fields invited Aertker to talk with students. She hopes books like his keep kids interested in reading. Aertker said he writes for this age group because he relates to it. The students had read a few chapters of the book before the author's visit. They will finish reading “Brainwashed” and complete writing assignments about it. Aertker's book is available on Amazon. via ‘Brainwashed' author inspires kids to read.